Super Mario and The Legend of Zelda are arguably Nintendo's most prominent and famous franchises. With a shared history spanning 25 years and a lot of games, fans have been treated to some glorious music, whether it's been chip-tune or orchestral. Now, thanks to Alfred Music Publishing, musical gamers have the opportunity to play through some of these famous compositions themselves. Four officially licensed songbooks have been released and are available in North America and Europe: Super Mario Series for Guitar, Super Mario Series for Piano, Super Mario Series for Easy Piano and The Legend of Zelda Series for Piano. Each book contains themes and arrangements from throughout both franchises' histories, and are available directly from the publishers, major online retailers such as Amazon or via the Apple iBooks store. Below is a trailer for the Super Mario songbooks that is strangely lacking any good samples of the music: it does give a look at the music sheets, if nothing else. Are any of you tempted by these songbooks? I knew how to play Super Mario Bros. theme on piano but I think I can't do it anymore. i would love it but i can just go print my own online on mario mania. That's cool. Always had to play those songs by ear. Yeah, I got both of the advanced piano books for my dad for Christmas, so...they've been available for a bit now. Nice of you to let everybody else know, though. Oh snap. I may have to buy these. I've been wanting to play NSMB's theme on the piano since forever, haha. I wish more instruments were available. I've tried both piano and guitar and so far haven't managed to stick with them. I suppose if these had been out when I was in grade school/junior high that story could have been different. No love for the flute, huh? A lot of Zelda songs would sound nice on it. Oh well, guess I'll keep trying to play by ear. They've gotta release violin scores! Then I'd so get it. @bobbiKat Definitely! Then I would get the Zelda Music, but probably not the mario music. Perfect birthday present for my piano and guitar playing mate next month. Excellent timing! Did anybody notice that the books have a song from Mario Sunshine called "Dolpic Town?" Sweet! Must get the Mario and Zelda piano ones! Now if someone could get me video game music for electric bass, I'd be impressed. Just ordered both, thanks for this news! @ 24 I can play the 'SMB overworld theme' on my bass guitar, figured it out by listing. I can give you the notes for that one, if you want. Wonder if they'll release one for ocarina, Lol. I find that I do better playing Ocarina by ear than by sheet music. It only works if you have a good sense of pitch like I have. Also, this music is already everywhere on the internet. I find these to be pretty much superfluous. Would you mind providing a link? @ueI I believe Dolphic Town is either the name of Delfino Plaza in the PAL region, or the Japanese name translated into English, not sure which. @ 27: That's sweet of you, I actually got the over world song by ear (and I know it on piano), some of the less popular songs from other Mario games I'd like to have. Like from Superstar Saga and Yoshi's Island.. I suppose if I sat down and was patient I could do it by ear... haha It's cool you play bass, too. Used to be able to play the Mario theme (Level 1-1) on guitar a while back. Forgotten it now though. LoZ electric guitar solo anyone? This is new to me, although, I have been playing guitar for a couple of years now. 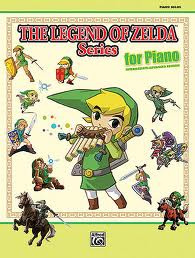 I never really used sheet music, nor do I have an interest to play the Mario songs, but, that Zelda collection I might get. I am a by the ear kind of person, but the harder songs with multiple instruments become a pain to distinguish the individual guitars and chords. I think I will be picking up Super Mario for Guitar, definitely. It'll give me a chance to take my guitar out of the closet and play it for once! Edit: Why doesn't this article appear in the "Retro" section? Needs "Retro" tag added. @34 The battle theme of superstar sage is one of my favorite pieces of game soundtrack It isn't that hard to play either. On which bass do you play btw? I have a Cort B4 ( a bass for beginners, have been playing for one and a half year now). This is cool! I might consider the advanced Zelda or Mario piano books...how expensive are they in the U.S.? Never mind, just looked for myself. Ranging $16.99-$19.99. I assume that is not counting shipping though. but do they have it for a recorder or a ocarina?